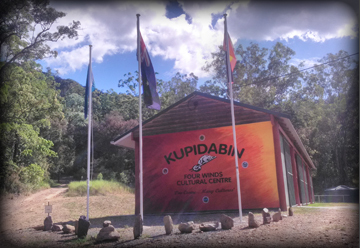 Kupidabin ‘Place of Possums’ and a place of peace and harmony will return to the way it began in 2005 with cultural activities. Our very first successful gathering facilitated by Native American Medicine Woman, Verlinda Montoya was held in 2007 with volunteer support from ‘Friends of Lyell Deer Farm’ prior to Kupidabin Cultural Association being registered in 2008. The management committee and members decision at the general meeting held on 19th October was to wind down Kupidabin Cultural Association Inc, with the final general meeting being held on 14th December for a ‘Special Resolution’ to disperse the financial assets of KCIA. This is not the end of my vision, but is a ‘New Beginning’. Commencing February 2017 the grounds and facilities will be available for workshops and retreats, and as a community space for various events, including cultural activities, festivals and fundraising projects. Bi-annual gatherings of the Four Winds will still continue, with the traditional Indigenous teachings from many cultures. We will be encouraging more multi-cultural activity during the year, inviting indigenous and ethnic groups to utilise the Kupidabin grounds and facilities for the ceremonies, festivals and fundraising projects, etc. All hire fees and/or donations will go towards the upkeep and further development of the facilities, with any surplus funds in the future to be donated to Moreton Bay Regional Council community groups and organisations where help is needed. For further enquiries, or to register for volunteer support, please contact us.